Surprise your mum with a Mother’s Day voucher to enjoy with the family next month! The bluebells are beginning to flower and soon the woodlands will be filled with a carpet of fragrant smelling wonderful wild flowers. This is one of our most popular times of year, with exciting photo-shoots for returning families and to welcome new ones too. Try not to miss this opportunity because the bluebells are in flower for only a limited time and are at their best for no more than two to three weeks, from past experience this is usually late April early May but does vary depending on the weather. It’s time to enjoy the experience of a bluebell photo-shoot so do get in touch so I can reserve your time and place - simply call the studio on 01883 722282 or even better come and say hello at the studio, our opening hours as below. We can personalise a gift voucher just for your mum to let her know just how special and valued she is, go on you know she’ll love it! Follow this link to our ‘Bluebells’ page where you can find out more. Thank you I look forward to photographing you! Crane in position for the dismantling of the roof structure.. 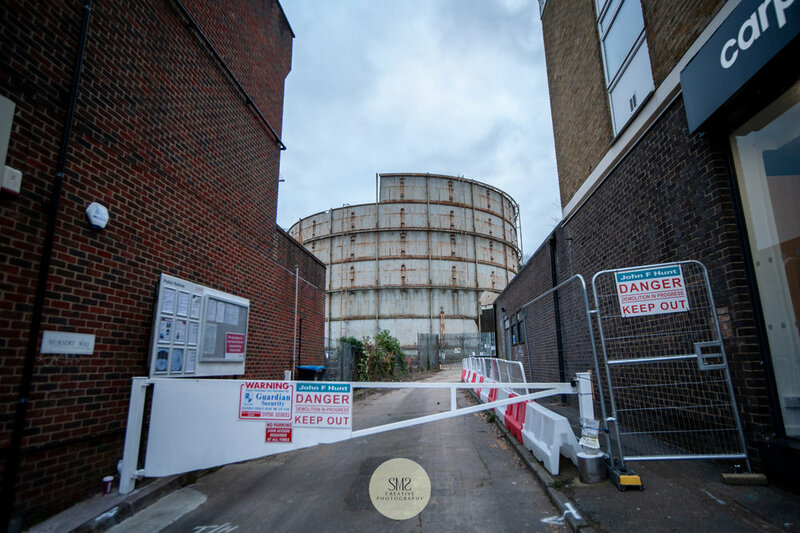 Welcome to my third newsletter about the dismantling of the gas holder. Documenting the process of the demolition of this beast is an eye opener as I watch small and large segments of the roof being cut away and dropped into the pit of the structure. From the outside it doesn’t look like too much has happened but I can assure you it has, the contractor John F Hunt has been working carefully to dismantle the roof in the first instance, leaving the sides free for dismantling. 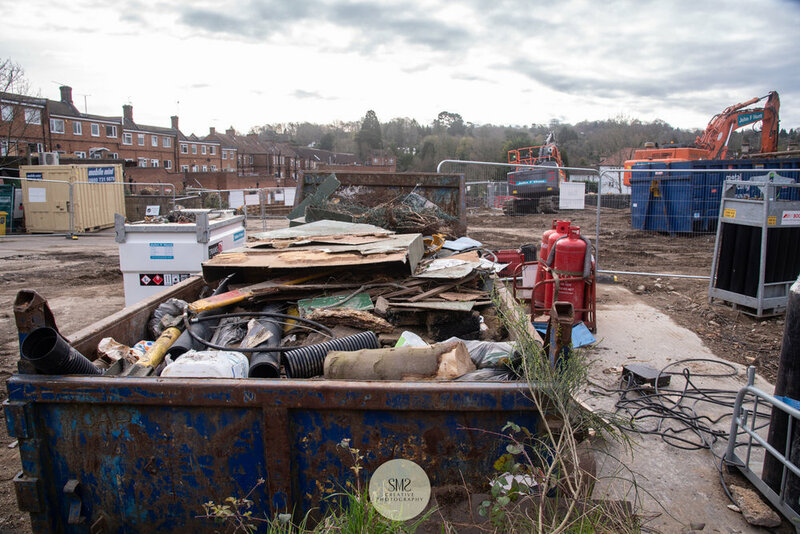 So far almost 500 cubic metres of metal have been removed from the gas holder and taken away in skips for recycling and that’s just from the roof! 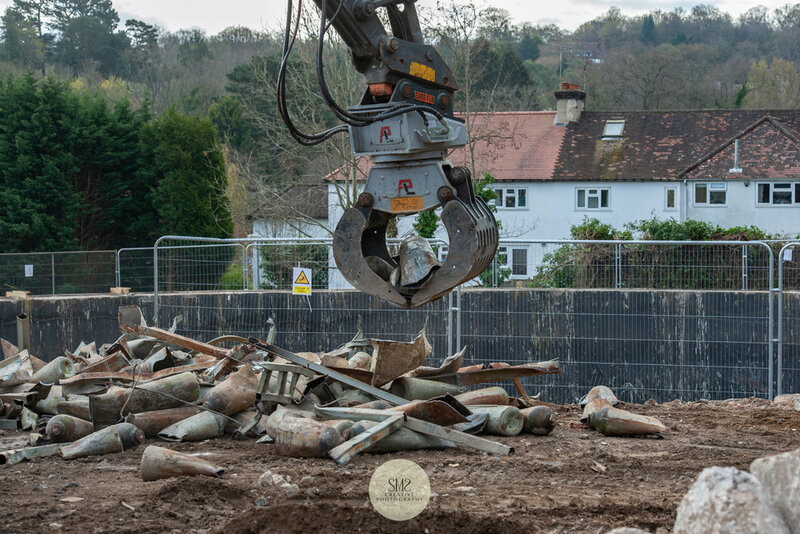 As the studio is so near to the site we can occasionally feel the ground rumble as we hear pieces of metal falling, other than that it’s easy to forget that such a vast demolition is taking place just a stones throw away! There are various viewpoints I choose to photograph from to show the progress and the difference for comparison further down the line, I have access to photograph on site too as some of the photographs below show. The mobile crane has now been exchanged for a cherry-picker which gives extra stability at height, allowing the team to work under greater wind speeds. 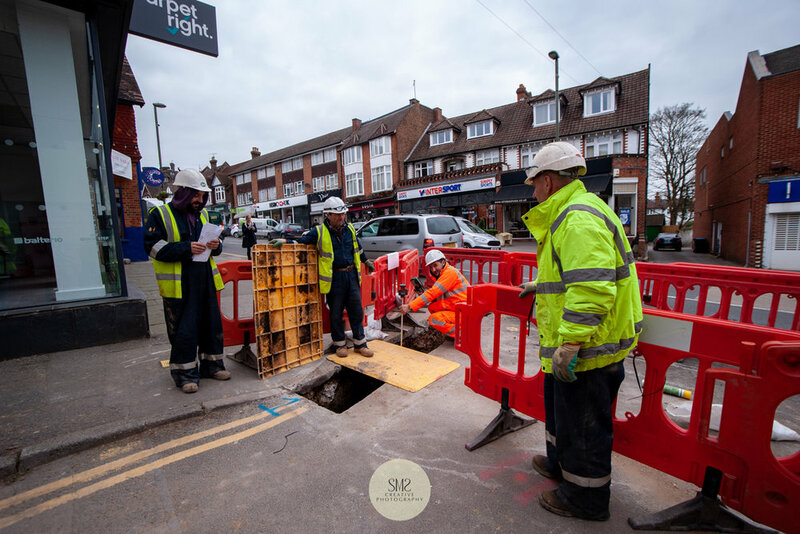 As part of the installation of the new utilities into the development for gas, water, electricity and data, St William will soon be undertaking two trial holes in the pavement outside the project on Station Road East. 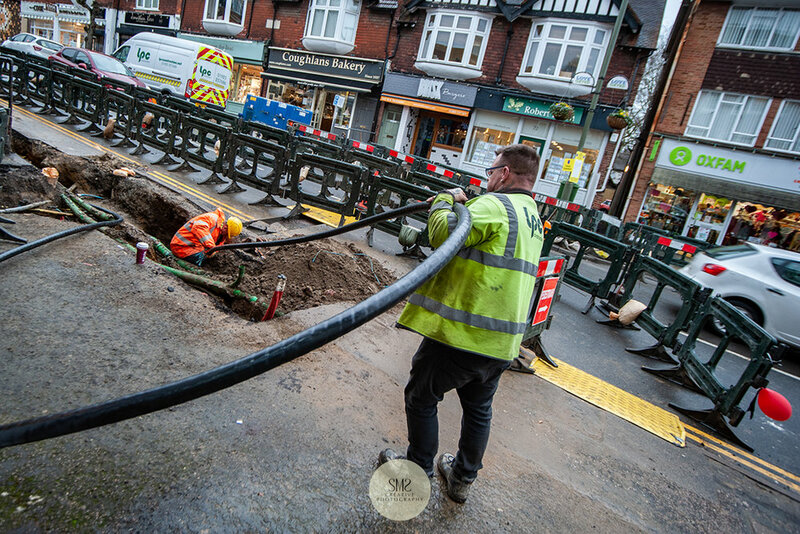 The purpose of this is to establish the location of the services within the pavement to determine the requirements for any service diversions or reinforcement to the pavement build up. 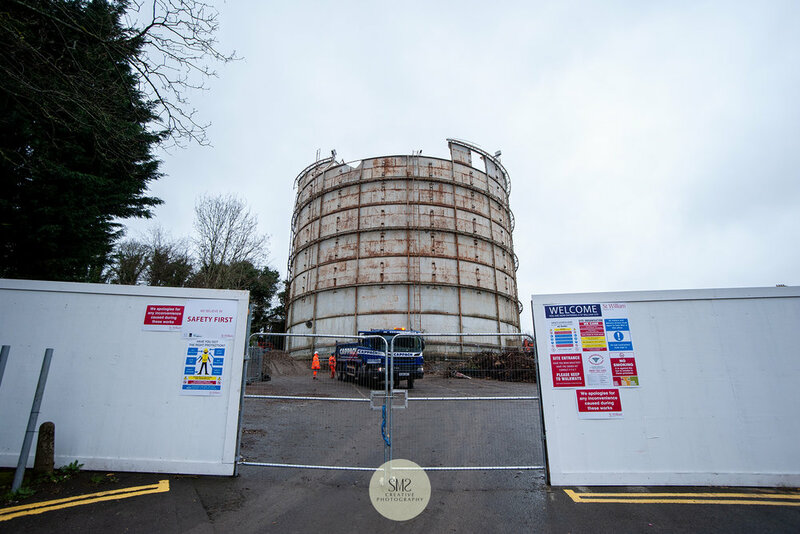 Other useful information to know is that site investigation has been undertaken at various points around the former Johnsdale car park, and there is more to be done around the gas holder in the coming weeks. This work involves hand digging small trial holes for soil sampling, then cable percussive and rotary drilling to establish the depth and description of the geological make-up of the ground. 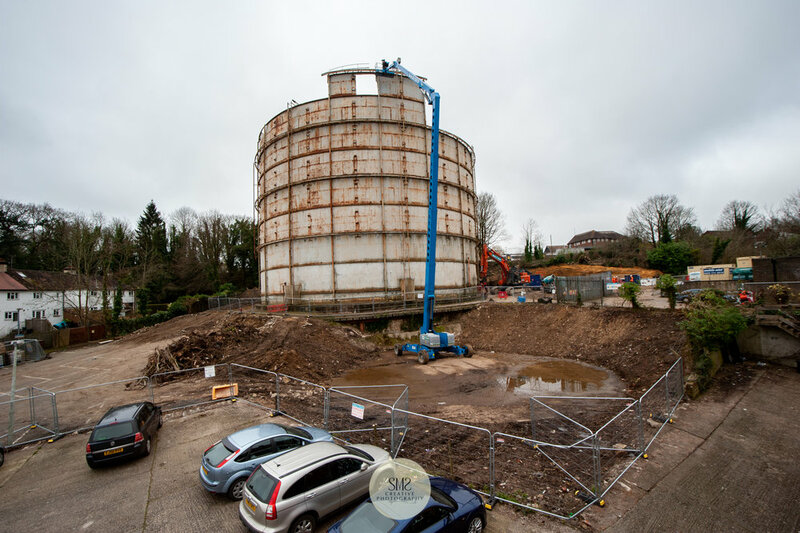 The gas holder is going to look very different this time next month as the sides come down reducing the height bit by bit. I’ll be out and about during the course of next month photographing the different stages, it should be virtually down by the end of April, let’s hope the weather is fine and dry so as not to slow down the process. 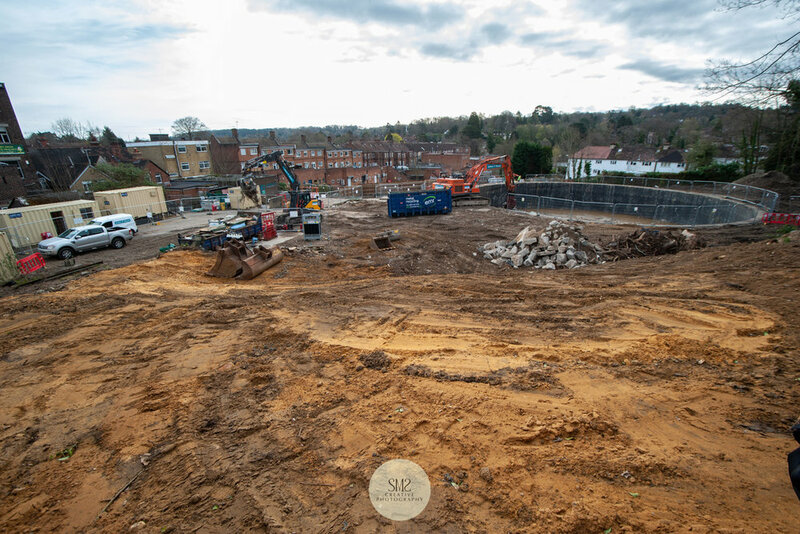 I went on site this morning, Friday 15th March and wanted to share the latest update photographs as below! The sound of the metal as it is dumped in the container is deceptive, it sounds like it is falling into a huge deep pit as the sound resonates. To read my first blog please click here and to read the second one please click here. If you would like to keep up to date and sign-up to my monthly round-up newsletter please scroll down to the ‘Subscribe to Our Newsletter’ button to enter your contact email address. The end of the day during the start of the dismantling process. 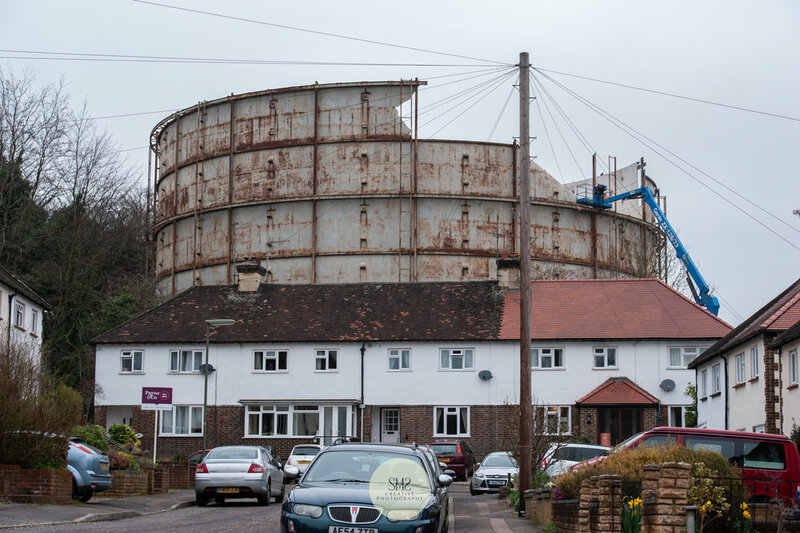 Welcome to my second blog about the dismantling of the Oxted Gasholder in preparation for a new housing development by St. William Homes called Courtyard Gardens. 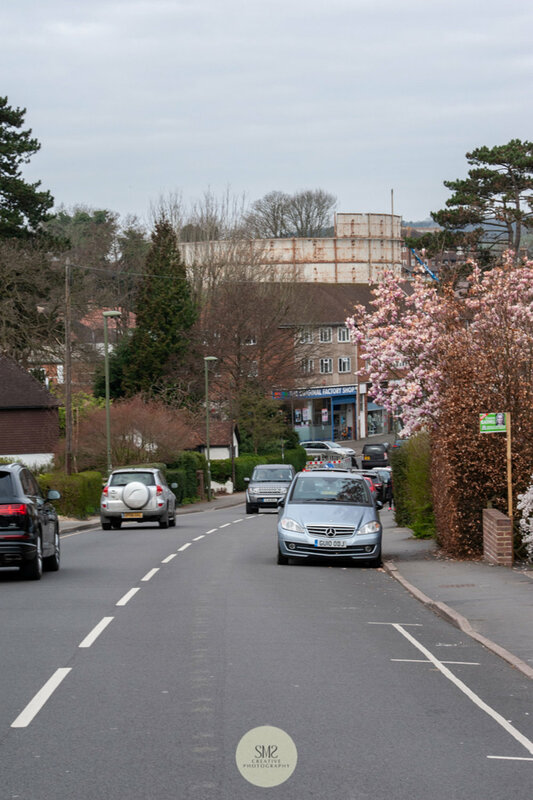 As many of you already know Oxted has been the home of SMS Creative Photography since February 1997 and the home of the gasholder for decades! 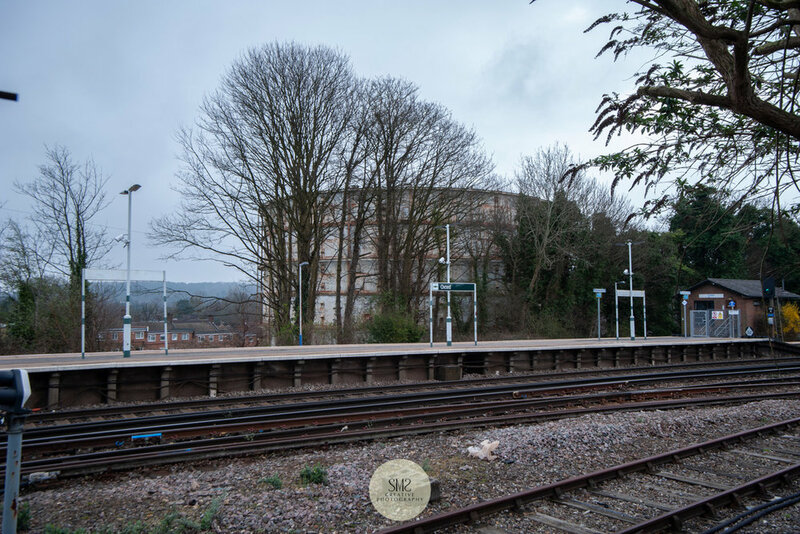 Over the course of the 2.5 year project my aim is to capture a photojournalistic viewpoint for posterity and to satisfy my own creative curiosity, my monthly blogs will give you a small insight into the process. 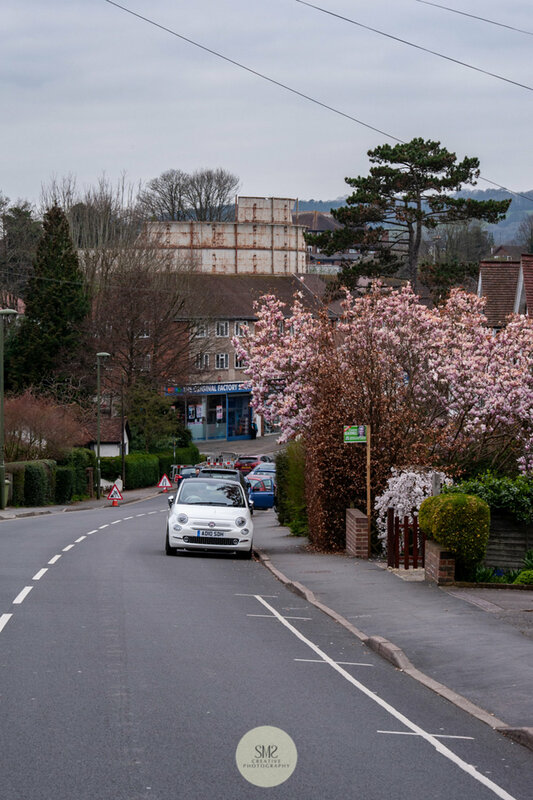 The site was cleared at ground level by removing trees, shrubs and the small out buildings, the levelling of the ground was in preparation for the delivery of the mobile crane which arrived on Sunday 3 February at 8am to a small waiting crowd. Demolition will be done by two operatives working from a basket attached to the mobile crane. 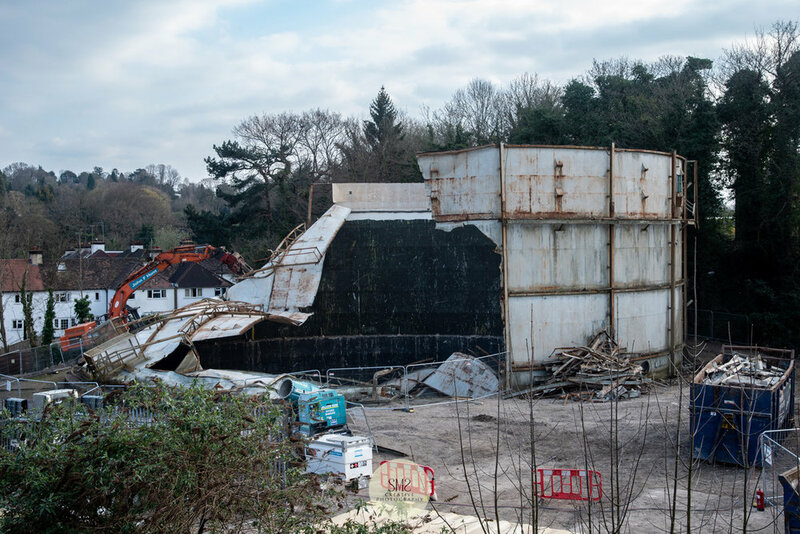 They will systematically cut small sections of the gasholder piece by piece which will then be contained within the gasholder prior to removal from site in skips, with demolition due for completion in May 2019. 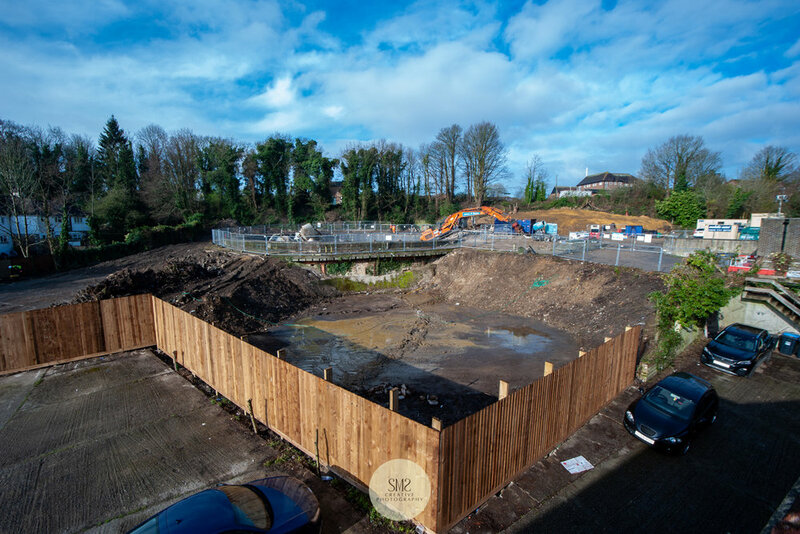 Following completion of the demolition the next activity will be to commence the groundworks and piling in preparation to build 3 blocks that will house the 111 homes within the completed development. 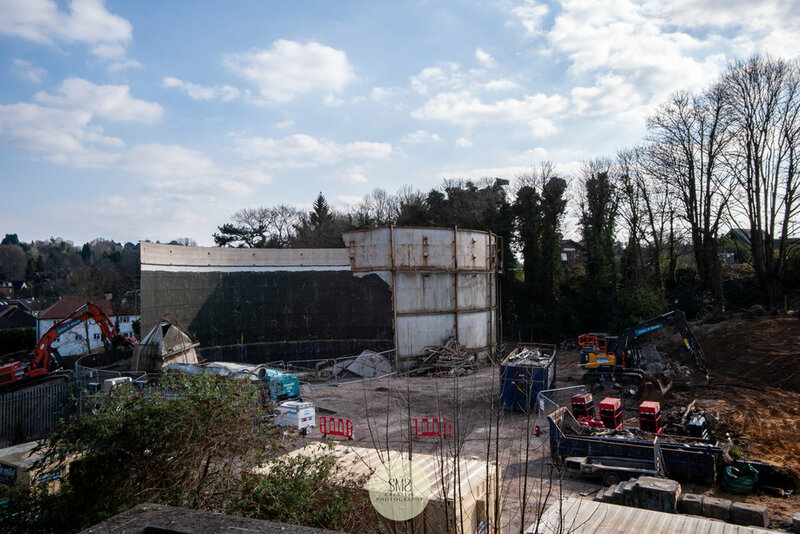 In order to prepare the site for the concrete structure to be built for all 3 blocks within the development, the equivalent volume of nearly 3 Olympic sized swimming pools of soil will need to be taken away! The first structures on the site including the gasworks are shown from 1896 on OS maps. There were previously three gasholders on the site, two have since been demolished but the concrete bases remain. 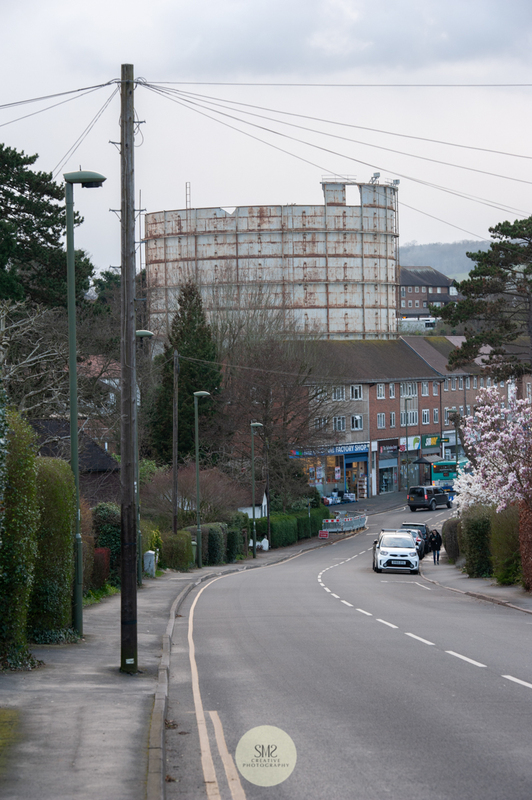 The existing decommissioned 30m gasholder sits over the footprint of the former gas generation plant. 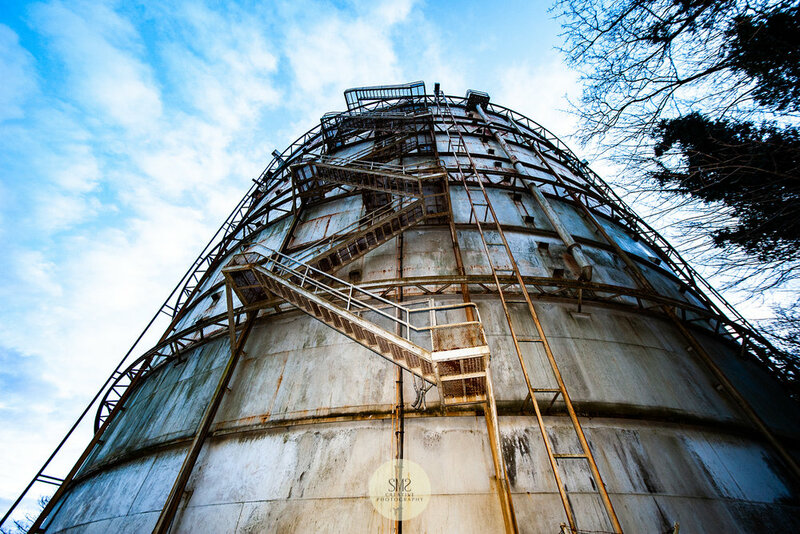 I recently went on-site to get up close and personal to see just what does the inside of a gasholder look like! Believe me when I say it is huge and pretty overwhelming too, having observed it from afar for so long it was daunting to have the opportunity to virtually step inside it! The photograph above of me posing in front of the gaping hole gives you some idea of the scale. This plaque sits at the bottom of the gasholder with a date of 1967 on the clip right of centre. 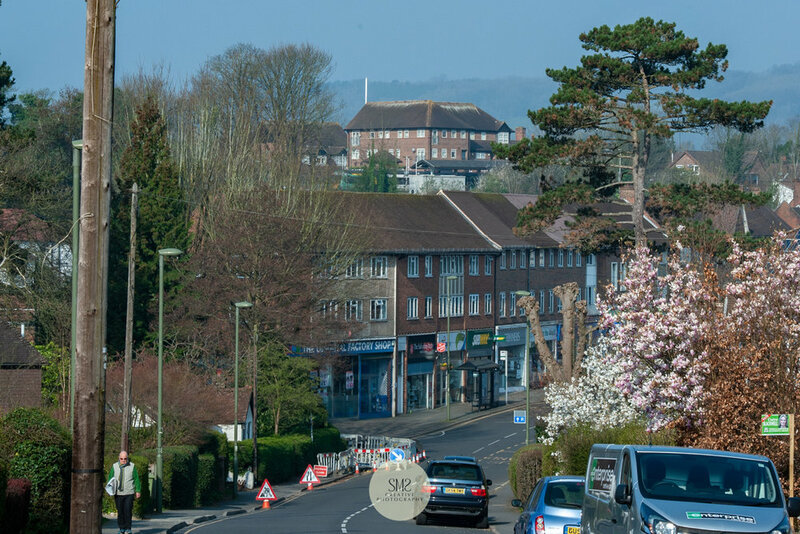 Local children pose for photographs waving purple Oxted Regen flags to witness the arrival of the crane. The arrival of the 60 tonne mobile crane on Oxted's Station Road East. The crane making its way to the site for the start of the dismantling process. The arrival of a 60 tonne crane early on the morning of Sunday 3 February attracted a small crowd to witness the occasion. A beautiful piece of urban art. 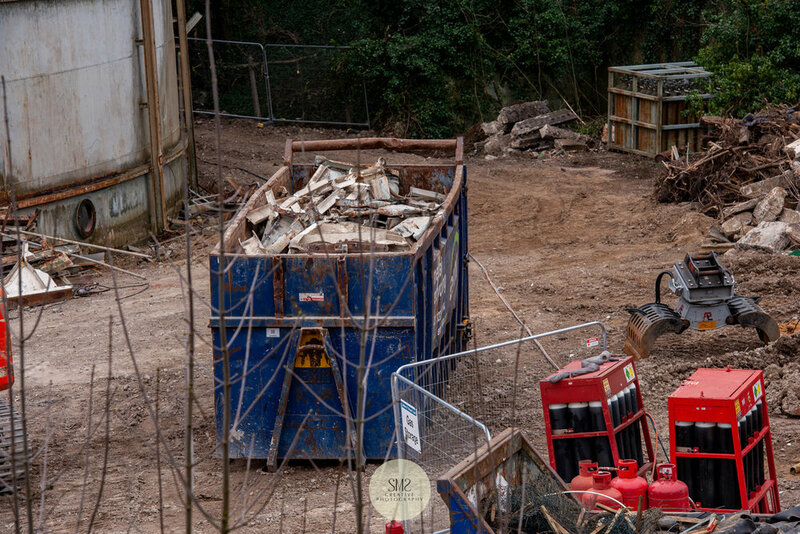 Rubble cleared from the site. 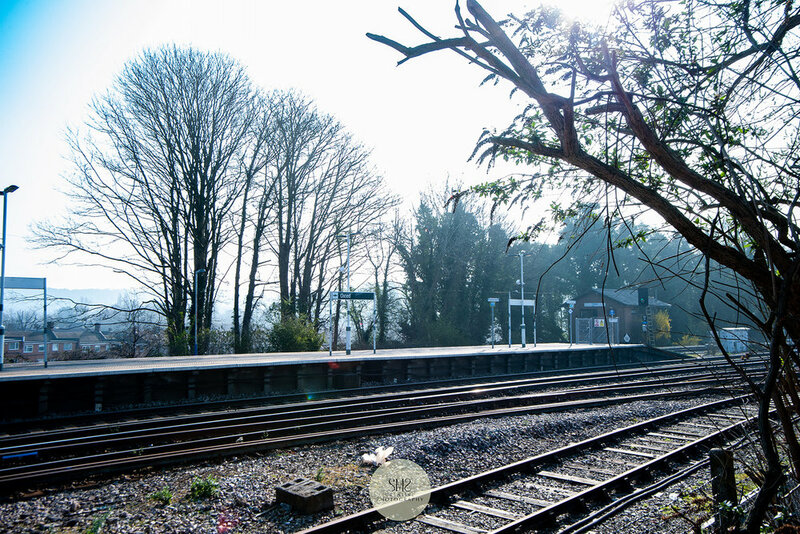 The full width of the site for development. The equivalent volume of nearly 3 Olympic sized swimming pools of soil will need to be taken away to level the ground. Cable for the rehousing of the sub-station. 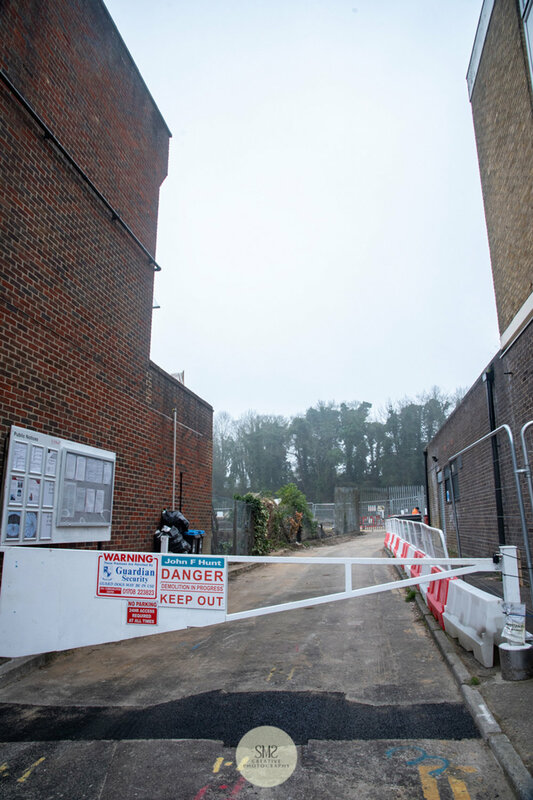 The works taking place on Station Road East outside the studio is the final part of the removal of the electricity sub station which previously sat in the grounds of the gasholder. This sub station has a new home at the council offices, at the bottom end of Station Road East on the opposite side of the road, the cables have to be redirected from underneath number 85, next door to the studio, and fed under the road and down to the new sub station, the process once complete should be about 4 weeks. The crane in position to carry the basket for the operatives. The base where a previous gasholder sat. Relocating the electricity cables to house the new sub station. The images above show the progress so far. Two operatives working from a basket attached by a mobile crane to systematically cut pieces of the gasometer. That’s it for this month, please join me next month for the next instalment, in the meantime I’ll be out and about capturing new imagery to reflect on in years to come. To read my first blog about the process please click here. If you would like to sign-up to my monthly round-up newsletter please scroll down to the ‘Subscribe to Our Newsletter’ button to enter your contact email address.